Accudio is no longer taking on new clients. All work for previous and current clients will continue, but as Alistair has started a new position at The Covey Agency as a Developer we will be doing no new jobs. The Covey Agency is a creative and digital agency in Portobello, Edinburgh offering services including graphic design, branding, traditional marketing and advertising, website design, development and hosting, digital marketing and SEO and more. If you are looking for any of these services, get in touch with with Alistair (through Accudio) or with The Covey Agency directly and we can see what we can do for you. We are a web design, development, and hosting agency located in the Highlands of Scotland based in the Strathspey area and the Isle of Skye. We create a variety of sites that look great however you view them. We design and build sites to fit exactly what you and your customers need, so it's easy to manage and a pleasure to view. To take the stress and hassle out of hosting your site, we offer extremely versatile managed web hosting at great value! We can also design logos or marketing materials to attract as many visitors as possible, or copywrite your site to boost your conversions! We focus on mobile-first design, and adapt that to desktop use. This means your site visitors will get a great experience on both. We build your site tailored to you and your visitors, so it's as effective as possible in both look and functionality. If you just need a simple informative site theres no need for a complicated CMS. We do great static HTML and CSS websites! We can also do advanced dynamic sites based on a CMS, including ecommerce, booking systems and more. As we can offer anything from HTML sites to ecommerce, we are very flexible, more than many other design agencies. Keeping you in the loop throughout means we can get the site you want and will be most effective easily and quickly. Many agencies overcomplicate web design and hosting. If you were popping to the shops you wouldn't use your 20-wheeled truck, you'd use your car or bike. However, if you were transporting cargo thousands of miles, your bike may not cut it! This is why Accudio offers multiple options when it comes to websites, so we can use the right tool for the job. We start with a free consultation meeting; phone call; or email. Here we can work out what you need, how we would proceed with building your site, and give you an initial quote and timescale. If required, we come up with a design mockup, followed by a draft site. With feedback from you and any additional requirements, we finish building your site, fill it with your desired text and images and make it live! Our hosting is based on Linux powered Virtual Servers in North Europe. As we manage them, we are very flexible so can offer more features than our competitors. Our websites are built to order but depending on requirements are generally based on HTML5/CSS3, RespondCMS, Wordpress, or Subrion. 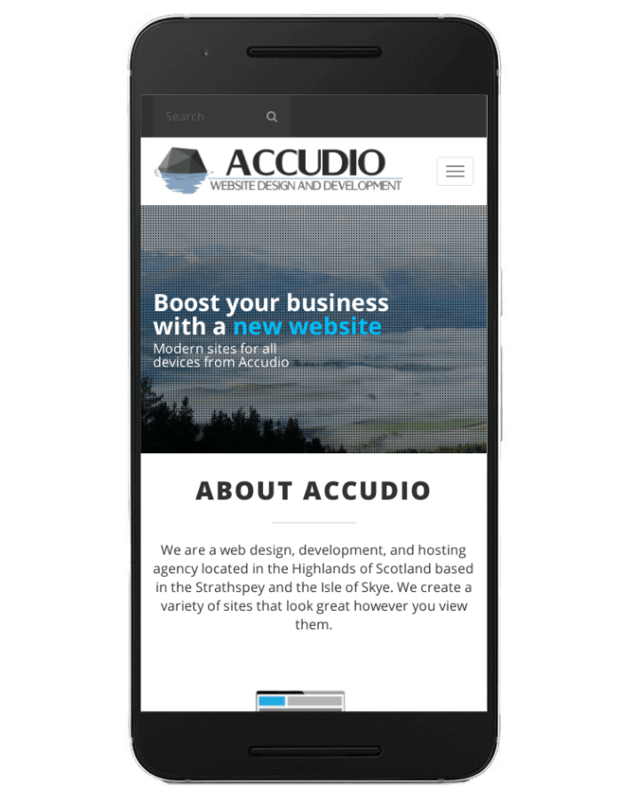 Accudio is run by Alistair Shepherd, a web developer and graphic designer wanting to get the businesses of Scotland looking great online.